We decided to run a series of collaborations with developers of dapps on steem blockchain. The idea was proposed by @cryptospa and @jeronimorubio found it good. 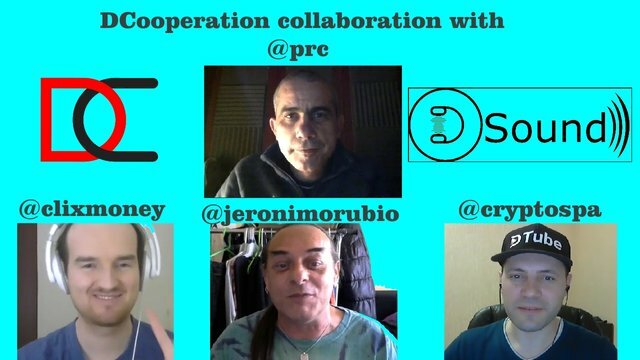 I'm @clixmoney the founder of @dcooperation community. We think that we have to collaborate more with dapps creators to improve the communication between both users and the creators. In this collaboration we invited @prc to talk about his amazing application @dsound. We asked him a few important questions about that. Hey, brother! I'll talk to you later. @prc is creator of Dsound ? Followed . You did a great job dude ! @emsonic, @prc is an awesome person and very talented developer. Thank you fellows! It was a nice chat! We need more of those collaborations. Will try to do it on a regular basis. Yeah, that was really great, thanks to you for inviting @prc ! You are very welcome! It is our responsibility (of each and every Steemian) to try to make our ecosystem work better. I think this project iis great, but a lot of Steemians do not speak English very well and sometimes, even if they know that language, they do not try to translate. I think that you could create something like a short and easy to understand whitepaper and ask to some Ambassadors to spread @dcooperation voice and news. I am from Italy and I really like cooperate and translate. What do you think about my idea? That's great idea, are you registred in discord ? The value of such interview is to ask any question you want, anyone can join, so users will be in touch with developers to know about what they are doing. We're creating awareness and that's the most important. I hope to see you in our community as well, I don't know why you still didn't join us ! To be honest I don't join any community because I prefer to do my own things! It's your choice, but I think communities have a lot of benifits and they are all helpful for newcomers. It's important to make people understand more things. That's why we love collaborations and we just enjoy them as well.